The muscle car craze had really started to catch on when Chevrolet introduced the 1965 Chevelle. Feeling pressure from the Pontiac GTO, Chevrolet really decided to step up with its offerings. Changes were not huge from the previous 1964 Chevelle in terms of basic body design, but the 1965 Chevelle received a new grille, new tail lamps, exterior touches, and interior. The 1965 Chevelle was available in several trim levels including the Chevelle 300, Chevelle 300 Deluxe, Chevelle Malibu, or Chevelle Malibu Super Sport. Each configuration could be ordered with a six cylinder or V8. Body style included 2 door sport coupes, 2 door sedans, 2 door convertibles, 4 door sedans, 2 door wagons, or 4 door wagons. Interiors could be optioned with either bucket seats or bench seats and were available in a variety of colors. The most popular were Aqua, Aqua two tone, Black, Light Blue, Blue two tone, Fawn, Fawn two tone, Red, Red two tone, Light Saddle, and White. The buyer could have ordered a number of different exterior colors including Tuxedo Black, Ermine White, Mist Blue, Danube Blue, Willow Green, Cypress Green, Artesian Turquoise, Tahitian Turquoise, Madeira Maroon, Evening Orchid, Regal Red, Sierra Tan, Cameo Beige, Glacier Gray, or Crocus Yellow. If those choices were not enough, the buyer could have also opted for a two tone paint scheme. Convertible tops were available in white, black, or beige. Vinyl tops were only available in black. To complement the wide variety of available colors were the available drive train combinations that could be opted for on the 1965 Chevelle. Base power was had by one of two available six cylinder. Buyers who wanted more power could opt for a V-8. A mere 211 1965 Chevelles (200 hard tops and 1 convertible) were equipped with the super rare Z16 option which called for a 396 cubic inch big block engine cranking out a monstrous 375 horsepower. These Chevelles also featured highly modified suspensions, power-assisted steering, and anti-roll bars in the front and rear, and stronger convertible type frames. Manual transmissions were either 3 speeds or 4 speeds and the only available automatic transmission was the 2 speed Powerglide. 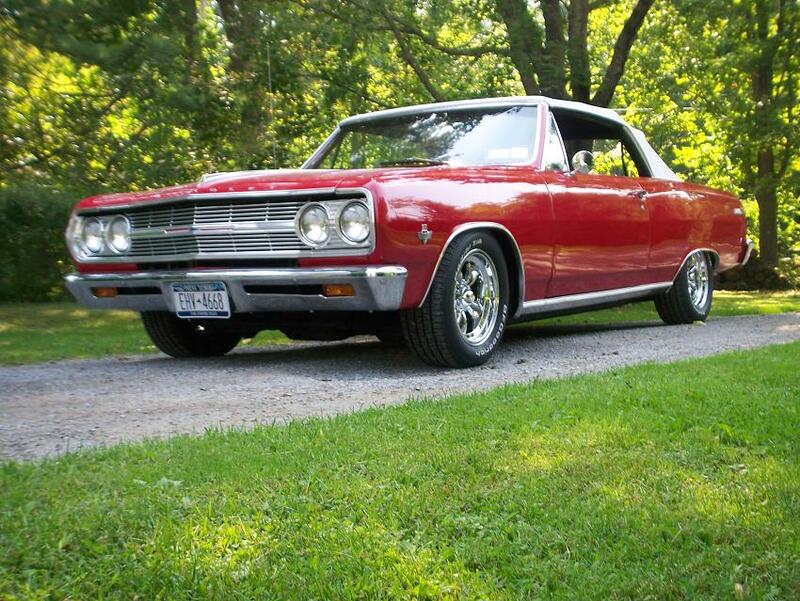 About 398,000 1965 Chevelles were produced.